Ed Hicks | The Goose Is Out! Ed is a banjo player and Magpie’s Nest regular who came to the Goose with Sam Lee and Michael Wright in one of our earliest Upstairs at the Mag evenings. 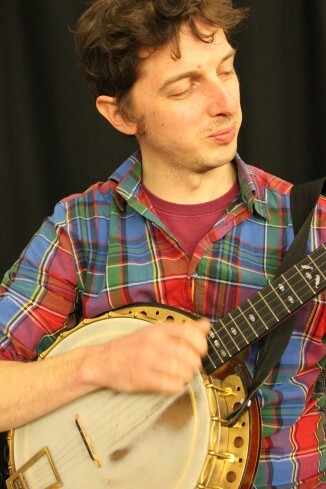 Ed has worked as a professional banjo player for the last ten years and plays regularly for Ceilidhs and Barn Dances as well as running several folk sessions. Ed has played banjo for Ramshacklicious Theatre Co, Cut a Shine, The Honk Project, Sam Lee, The Popcorn Cinema band, Aaron Jonah Lewis, The Imaginary String Band, Sleepy Ed Hicks, The Cockney Awkestra and The London Dixieland Jazz Band. Ed has trained in music workshop leading with Spitalfields Music, EFDSS, Music for Change, Musicleader, Sing Up, Folk Arts England, Platform for Arts and the Discover Centre. Ed works regularly as a music workshop leader for the English Folk Dance and Song Society and runs the school folk band at St Maryelbone School in London. Ed plays banjo, fiddle, guitar, mandolin, anglo concertina and sings. Click here to go to Ed Hicks’ website!